This is the original cover, from the edition published February 1, 2009. It is a much more appropriate cover based on the story. The silly paranormal romance style cover of the new edition, published July 31, 2015 is completely inappropriate to the strength of the storyline. So, ignore the new cover, ignore the PR style blurb, and read the review. Then read the book – it’s really good! It is hard enough being a librarian when “the ‘good citizens’ of Jericho City would pay thousands yearly for plastic surgery and to pad the pockets of the mayor’s friends, they simply would not vote a couple of measly bucks onto their property taxes to take care of her library.” Nope. That is minor compared to having to track down a skornac in the sewers and kill it with a knife. Bloody tentacled demon was eating kids – what else was she supposed to do?! But killing a skornac demon draws attention – attention that could very well make her a bloody librarian smudge on the ground. 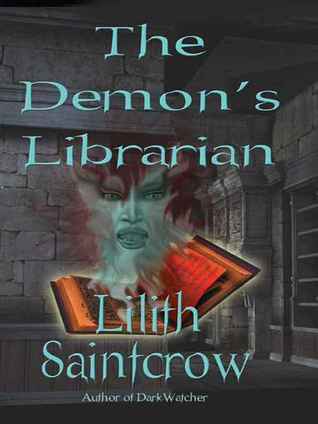 I read Lilith Saintcrow’s Jill Kismet series several years ago. (Wow. Hard to believe 2008 was ‘several years ago’! ), back before I started writing reviews, but I rated them four and five stars. Then? I just wandered away. So many books, so little time! So, when I had the opportunity to read The Demon’s Librarian, I was well pleased. It is nice to greet an old friend. This book didn’t disappoint. Chess is one tough librarian. Since finding (or being found by) a sorcerous library hidden behind a magical wall in the basement of the Jericho City library, life has been, well, interesting. Interesting in the Chinese, “May you live in interesting times” sort of interesting. Interesting enough that she spends a lot of the time in the fight gym learning how to protect herself, and a lot of time in the basement learning sorcery. Then, things get truly, well, ‘interesting’ in a very bloody, very painful way. When a tall, handsome, tweed-jacketed fellow comes into the library one day, walks straight to Chess, and asks for Delmonico’s “Demons and Hellspawn” – and when the Phoenicis Fang at her hip, the magical knife she created herself, goes hot and vibrates – she knows she has problems. What sort of creature is this? Certainly not human – he smells too much like demon for that. But what is he? Then, a demon tries to break into her apartment through her wards – and another creature attacks the demon, taking it out in a smelly, messy manner – all Hades breaks loose. Because it isn’t just demons she has to worry about. The Order of Dragons has their own knife to grind. And Chess is not only a newly-minted demon hunter. She could very well be more. And everyone suddenly has way too much interest in using Chess for their own purposes. I like Chess a lot. Her character is strong and tough – but not too tough. She is genuine. She holds her own against some really nasty creatures, but she also has the occasional “break down into a crying, quivering mess” moments that make her real. Yep, sometimes I wanted to shake her, but in her place? Uh. I wouldn’t be as brave as she is! If you like Urban Fantasy with lots of blood, a creative storyline, interesting characters, and a solid storyline, this is one to pick up and enjoy. I received this book from the publisher in exchange for a realistic review. All thoughts are my own. If you enjoy my reviews, please let me know by “Liking” my reviews on GoodReads and Amazon. Thank you so much! See what I mean? Pft. The book is about the Librarian! Yeah, yeah. There is ‘romance’ in a way – but the story is much stronger than a PR. Not putting them down, just saying that this is More than that . . .